Why do Taxi Businesses need to invest in on-demand taxi dispatch apps? Home » Taxi Dispatch Software » Why do Taxi Businesses need to invest in On-demand Taxi Dispatch App? Tight competition from the On Demand Taxi Dispatch apps like Uber and Ola has created serious challenges for the taxi businesses. Thanks to their taxi dispatch apps, booking a cab is now just a tap away! Traditional taxi businesses are hence facing a hard time since their customers are moving towards these app-based cab hailing services which offer a much better taxi booking experience. While many taxi and cab companies are still stuck with inefficient phone call bookings, their competitors are using the latest taxi dispatching apps. Statistics tell that the taxi businesses are losing $20 million on an everyday basis, only because the passengers are unable to find a cab. In a taxi dispatch app, the interaction between drivers and passengers are now through a digital platform like smartphones, so that the services are quick and unique compared to the conventional system. So investing in taxi dispatch app to build a mobile booking channel has become a very important step they need to take for their survival in the present world. Embracing the latest technologies or in other words, staying updated is very much mandatory for any kind of business to fly high. In this smart world, not having an on-demand taxi dispatch app will have a huge opportunity cost. One of the best things about a taxi dispatch app is that it connects in real time with your folks. Why you need to invest in a Taxi dispatch app? Being is visible is always a very important point to note for the taxi business to run smoothly. Having a taxi dispatch app for your taxi business gives a broad visibility. For instance, tourist commonly uses their smartphones to hail a cab or taxi, whenever on vacation. And if you don’t have an efficient taxi dispatch app, you could lose a lot of customers. A taxi dispatch app would definitely earn you more profits than working with the popular aggregator apps, where you would need to pay heavy commissions. And here, you do not need to pay an money to other people. Also, if you would like to work with the giants in the field like Uber and Ola, you have the necessary option too. A taxi booking app helps to connect the customers to your drivers in real time via a driver dispatch app so that your taxi business can smartly grow in autopilot mode. This also offers a better booking experience for your customers, by reducing their ETAs(extended time on arrival) and more, enhances driver performance and also reduces the overhead costs generated by managing everything manually. Building your own taxi app is just a cakewalk! The only thing is that you need to choose the best taxi app development company in the field. They would be helping you to develop apps tailored to meet your specific business requirements with custom features and integrations. The ultimate solution to your dwindling taxi business lies in the mobile platforms. They have opened the doors to modernize your taxi business. Investing in a taxi dispatch app would take your customers’ taxi hailing experience to the next level! Why wait? Go for it now! Are you looking to modernize your taxi business with a highly efficient taxi dispatch app? Do check out our taxi app development solution. We offer you the best ways to manage your fleet of Taxi. 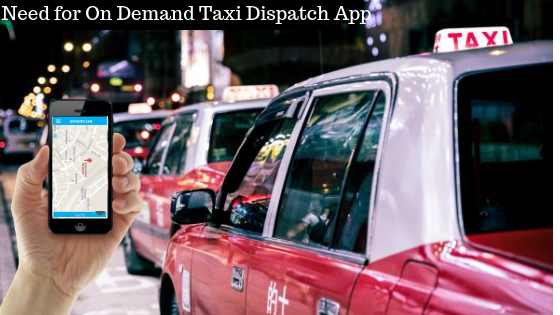 Our taxi dispatch app development team will work closely with you to deliver a high quality and reliable product which could be customized according to your special business needs. No Thoughts on Why do Taxi Businesses need to invest in On-demand Taxi Dispatch App?